Sharon Gayter has gained fresh impetus as she closes in on the 400th mile of the gruelling Flora 1,000 Miles Challenge tonight - thanks to the support of dozens of Evening Gazette readers. The Guisborough ultra runner revealed that she had received lots of Good Luck cards and messages since her London address was featured in our newspaper. Sharon said: "Thanks to everybody who has sent cards. "All of them are above my bunk and will give me inspiration throughout the Challenge." 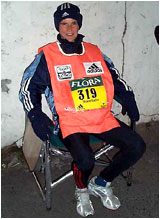 Sharon, who must run one mile every hour for 1,000 consecutive hours, along with her remaining four competitors, is still in good spirits and reports no major problems. However she has picked up a couple of blisters from trying to break in another pair of running shoes. She said: "I've mainly used just one pair of shoes but as they are beginning to wear down I think I'll need two pairs to complete the 1,000 miles." Sharon is accompanied by husband Bill, but has a new night-shift helper this week, Mike Harper from her club, New Marske Harriers. Send your cards to Bill Gayter, Room 112, Travel Inn, 159 Tower Bridge Road, London SE1 3LP.